The OMB-DBK208 signal conditioning and expansion board can be configured with up to 16 isolated Opto-22 compatible solid-state relay (SSR) digital I/O modules. Two 8-channel banks can be jumper-selected as either inputs or outputs. Each channel features screw terminals for the convenient connection of field signals, as well as LEDs to indicate channel status. Each user-configurable signal conditioning module offers 500 V isolation from the system and from other channels. 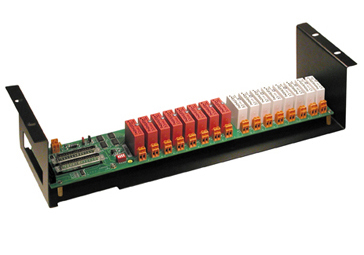 A wide variety of SSR I/O modules are available to sense AC and DC signals and to switch AC and DC loads. An on-board jumper (JP2) allows users to determine the status of the digital outputs in the event of the loss/recovery of external power. When enabled, the loss of external power disables module outputs until the application program writes new values to the data bus. When disabled, the loss of power has no effect on the state or continued control of the outputs. Additionally, on-board logic disables module outputs upon detection of a CPU reset. For the OMB-DAQBOARD-2000 Series boards, only a single OMB-CA-195 cable is required to terminate to the OMB-DBK208. For applications with digital I/O only channel expansion requirements, up to 16 OMB-DBK208 boards can be daisy-chained via multiple OMB-CA-37-x cables, providing expansion up to 256 digital I/O channels. For applications with both analog and digital I/O channel expansion requirements, the OMB-DBK206 and OMB-DBK209 expansion adaptor boards are available. All OMB-DBK signal conditioning and expansion boards are scanned at 5 µs/channel. The OMB-DBK208 ships with panel hardware; it can also be rack-mounted with the optional OMB-RACK3 rack mount kit.